Hello everybody, welcome back to Crafty Time 4U! I hoped you had a super nice weekend! Last Saturday I was at the Marker POP blog sharing with you some these Halloween inspiration using some Lawn Fawn stamps and dies! 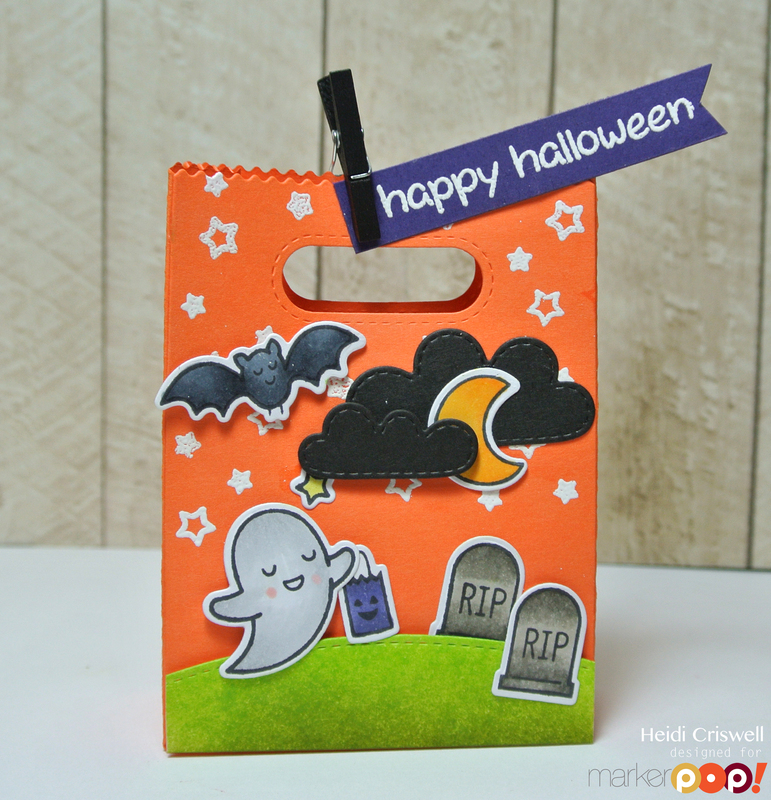 These goodie bags are sure to delight kids or even grownups, fill them up with your favorite candy and hand out some Halloween joy! I created individual scenes on each goody bag, let me show you and I will tell you a little more about them. For this goodie bags I used multiple Halloween and some non-Halloween Lawn Fawn products. 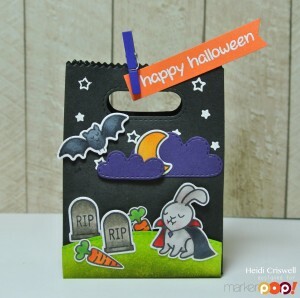 I cut the goodie bags from cardstock and I used some of the little stars from the “spooktacular” stamp set to heat emboss a starry sky. 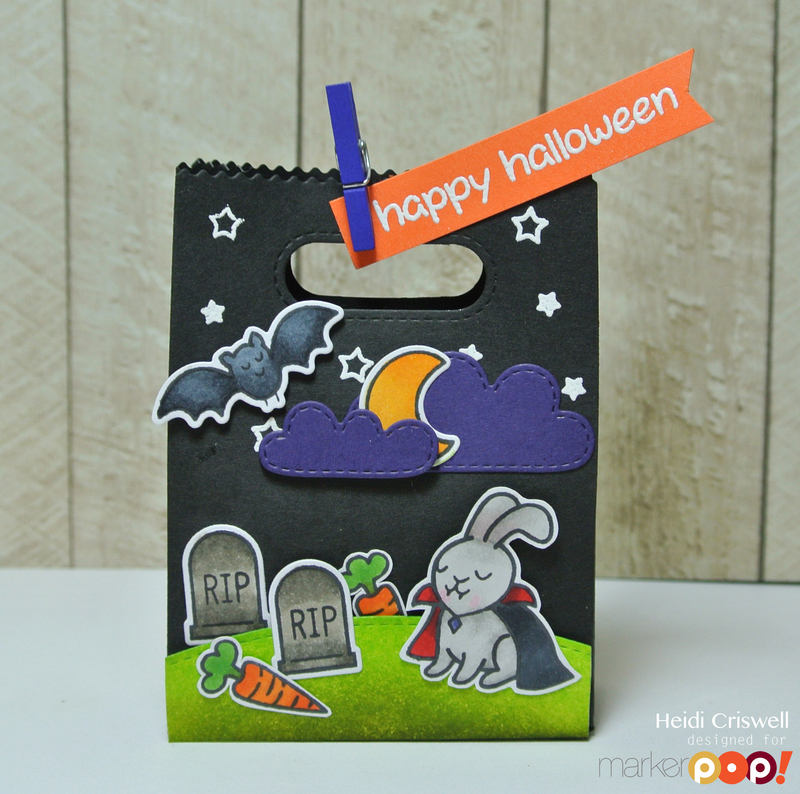 Then I stamped and die cut some images from the “trick or treat,” “hoppy Halloween,” “Critters in costume” and “spooktacular,” and arranged the scenes on the front panel of the goodie bags. I cut the clouds from cardstock, using the clouds from the "spring showers" stand along die by Lawn Fawn and I also created a hill from cardstock using "twisted citron" and "crushed olive" Distress inks. 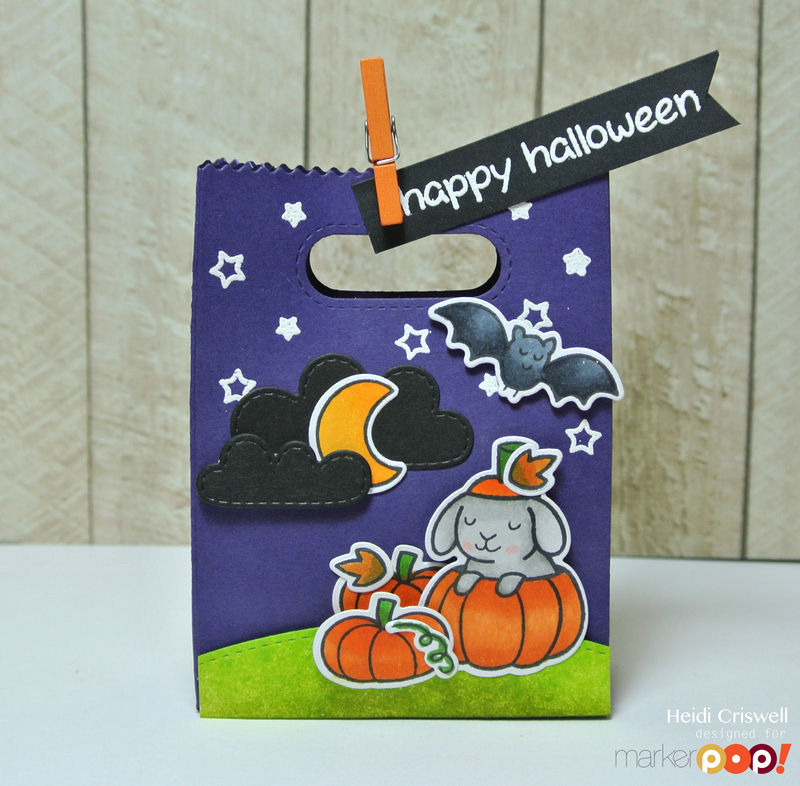 The "happy halloween" sentiment that I used is from "hats off you" stamp set and I heat embossed with white embossing powder and attache to the goodie bag using coordinated tiny clothe's pins. I hope you really enjoyed these goodie bags and that you got inspired to create fun gifts for your family and friends this Halloween. Awesome holiday treat bags. I need some for my students! You always make the sweetest treat bags! These are amazing!! I love the little scenes you created on each of them! Just darling Heidi!! I adore those goodie bags! The scenes you've created on the front of those bags are just TOO super cute! I absolutely love these treats!! The colros are images are too cute!! !